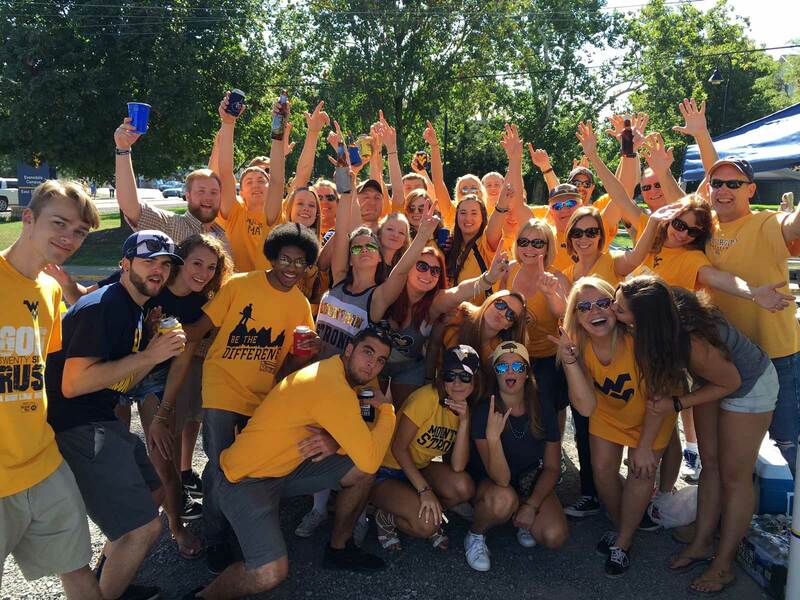 Despite a noon kick-off, Mountaineer Nation made sure to get as much pre-gaming in as possible for National Tailgating Day Sept. 3. Dave made a new record when he arrived at the gold lot at 6:13 a.m. When I showed up at 8:20 a.m., the lot was filling up fast. Unlike the typical season opener, the air felt rinsed and clean rather than wet and sticky from overbearing humidity. It was a perfect day. The sun was shining, a breeze was blowing, and the fans were frolicking. And for Dave and me, the pre-gaming had started the night before at Mario’s Fishbowl. It’s the ultimate place to start your game-day weekend. The Fishbowl has its own flavor, color and character. It’s more than what you can see. It’s a feeling. 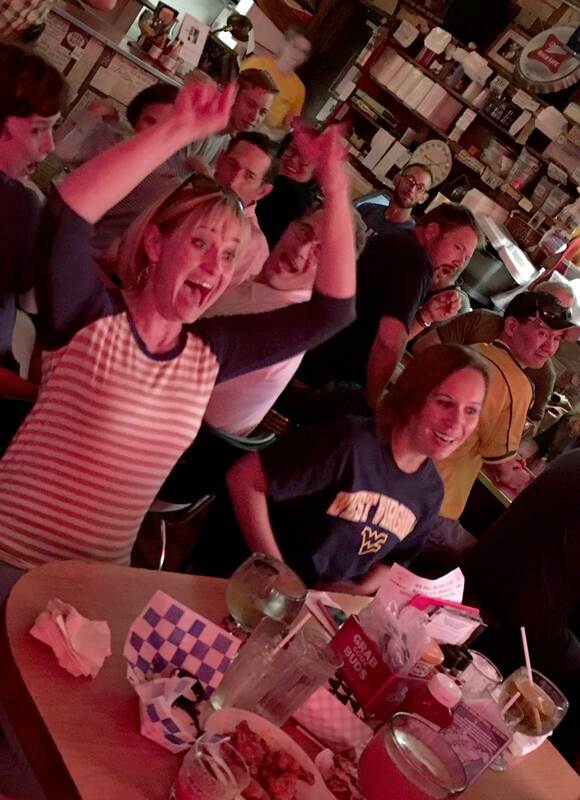 When folks walk into the Fishbowl, they’re greeted like conquering heroes by rousing cheers. On this particular Friday, I went all out in displaying my leadership ability. We sat at the table in front of the door and made sure everyone received a true Fishbowl welcome. We continued our revelry the next morning in the gold lot. 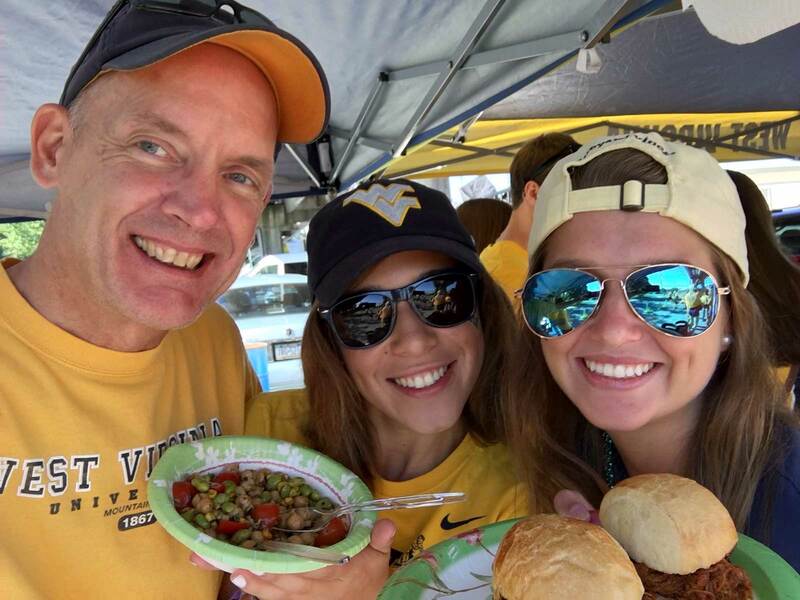 One of the things I most look forward to on the first game of the season – besides watching my team play – is reconnecting with the friends we’ve made (and the students we’ve adopted) tailgating. The tailgating seemed fleeting with a noon start time, but we still managed to have a raring good time in the gravel lot. We ate delicious food, drank quality beer, and chewed the fat. The students even played some beer pong. The game was designated a gold rush, and as we entered the stadium, layers of people swirled on top of each other like sun-drenched fields of goldenrods. 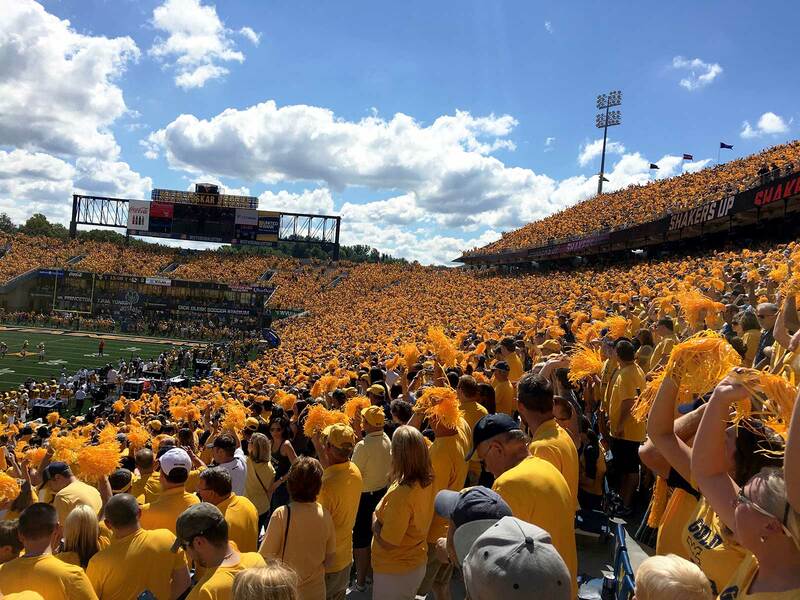 In honor of the start of 125 years of WVU football, Coca-Cola also provided 60,000 WVU125 gold shakers to Mountaineer fans at the game. Let’s just say the game was golden. 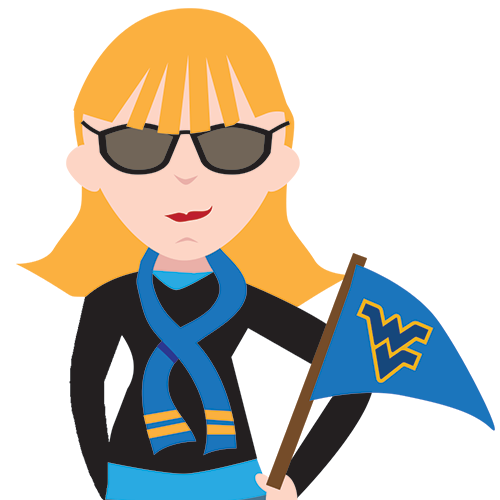 Our Mountaineers beat the Mizzou Tigers 26-11. After standing arm-in-arm singing Country Roads at the end of the game, Dave and I headed back to Mario’s Fishbowl. This is as much of a game-day tradition to us as singing Country Roads in the stadium after every victory. 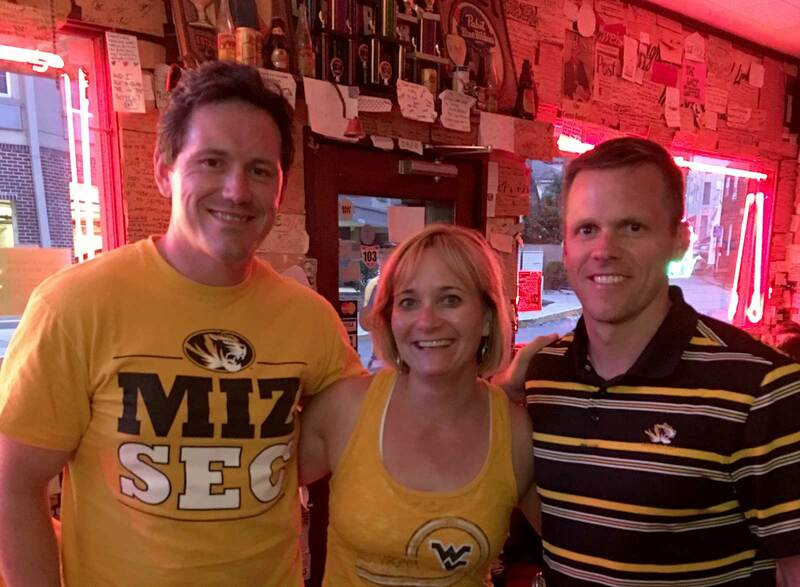 As we were exhibiting our unmatched bonhomie for incoming patrons, a couple Mizzou fans walked in. I’m not sure they knew what to think at first of our loud and boisterous cheers. After they settled into a booth, I went over to introduce myself and welcome them to Morgantown. It turns out they played for the Mizzou football team in the late 90s. Kent was a wide receiver and Rob Riti was a center. Rob and Kent rank up there with other notables I’ve met at the Fishbowl – former WVU football standouts Owen Schmitt, Grant Wiley and Major Harris; former WVU basketball player Deniz Kilicli; and golf pro Jim Furyk. 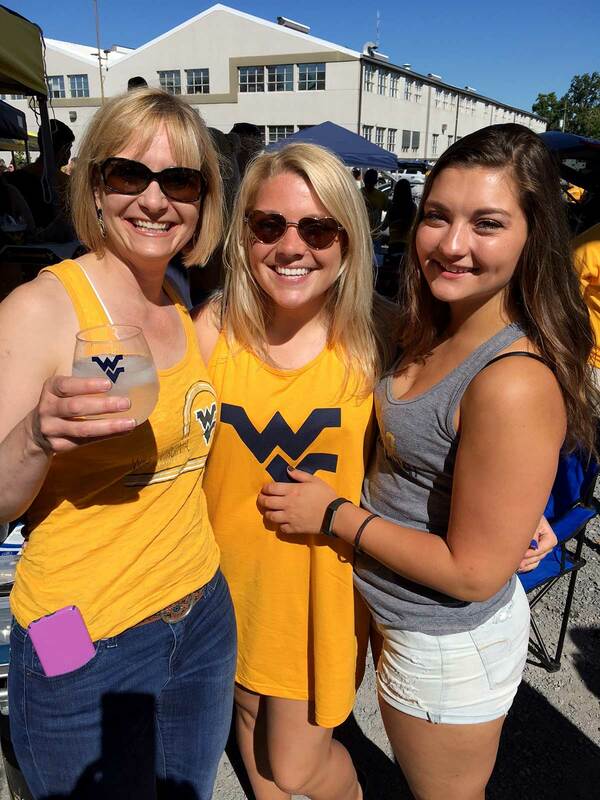 It was their first trip to Morgantown and both raved about the hospitality of Mountaineer fans. And, of course, of all the cool places they visited, Mario’s Fishbowl really stood out to them. Kent had checked out my travel guide before coming to Morgantown and heeded my advice to experience the Fishbowl. 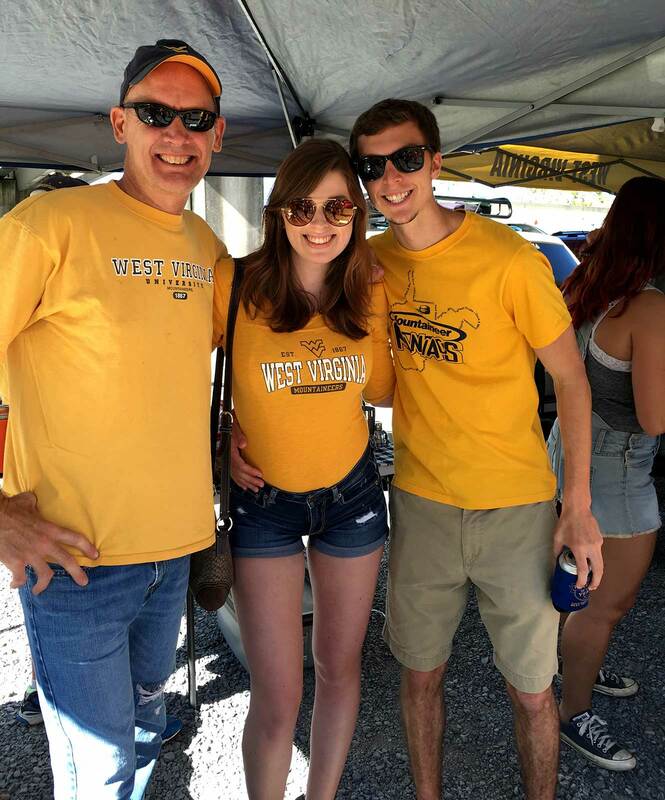 Although, as loyal Tiger fans, Rob and Kent would’ve preferred a different outcome, they had a great time in Morgantown and would gladly return. They’ll be back! Sounds like a great way to kick off the season. Can’t wait to experience it myself during the Kansas match up in November. I look forward to having you and Hank at our tailgate. And Dave especially likes that you get up as early as him.